Eosinophil under the microscope (400x) from a peripheral blood smear. Red blood cells surround the eosinophil, two platelets at the top left corner. 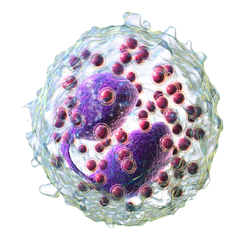 Eosinophil granulocytes, usually called eosinophils or eosinophiles, are granulocyte white blood cells that fight off certain parasites and infections in vertebrates. When they are activated, eosinophils release a cocktail of proteins from their granules, including heparin. Like mast cells and basophils, their main targets are parasites, and they are part causes of the syndromes called asthma and allergy. Eosinophils make up 1-6% of white blood cells circulating in the body. They are similar in size to neutrophils but have reddish-orange granules (when stained with eosin) and a bilobed nucleus. Eosinophil granulocytes are important defenders against large, multi-cellular parasites, such as worms and flukes. Their numbers increase during a parasitic infection. ↑ "eosinophil - Definition of eosinophil in English by Oxford Dictionaries". Oxford Dictionaries - English. Retrieved 27 March 2018. This page was last changed on 28 June 2018, at 12:25.